Sounds fancier than it is. I have a handful of beets left in the garden, so I picked some last night to have with dinner. We tend to have beets with salad, so I wanted to change it up last night. Start by roasting. I had five decent sized beets – wash them, cut the greens off just above the root (leaving the top intact), and trim the long part of the root. Wrap in foil (some people do individually, I did them all in one packet) and bake on 350 F for about 45 minutes, give or take, depending on the size of your beets. While they were baking, I crushed one clove of garlic and added to a saucepan with about a Tbps of oil, and heated until fragrant, not quite getting to the brown stage. I also still have some thyme outside, so I picked a few sprigs of that and added the leaves to the oil. Finally, add a Tbsp of balsamic vinegar and simmer until reduced and a little thicker, not quite syrupy. The oil and vinegar are, as always, rough estimates. Vary the amount depending on how many beets you have. When the beets are finished roasting, remove them from the foil, let cool for a few minutes, then cut to your specification. I cut them in half and quartered each half. Add the cut beets to the vinegar mixture, stir to coat, and enjoy. Beet greens are the other parts of the plant that, unfortunately, are not used very often, but equally delicious. Being the end of the season, a bunch of the leaves were chewed up and in various states of decomposition, but I picked off enough good ones to make a couple cups’ worth. Just before you’re ready to serve, add the greens (whole or torn into smaller pieces) to a pan with a small amount of hot oil. Saute until the greens are limp, only a few minutes. I added a little salt, pepper, red pepper, and the smallest pinch of sugar to enhance the sweetness. The beets themselves have that unique earthy, sweet flavor, and the zing of the vinegar offers a nice counter. 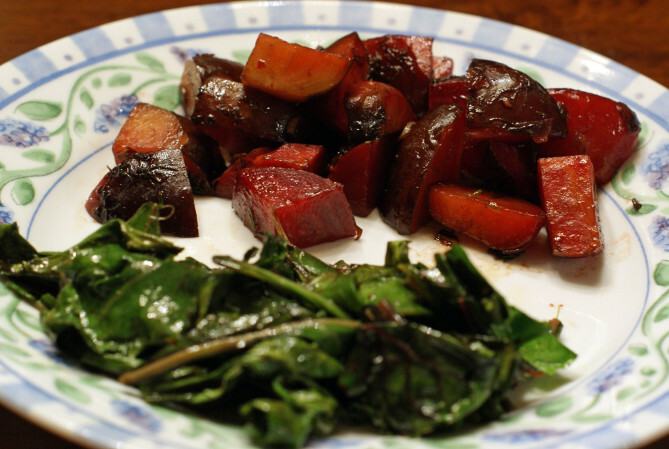 The greens, like most other kinds of leafy vegetables, are just slightly bitter, but also have a hint of the beets’ sweetness that makes them unlike other greens. Simple preparation, and better yet, two sides out of one vegetable.